Click here to view an online catalog with many keepsake options. Grow a living memory from your loved one's cremated remains. The Living Urn is a biodegradable urn and planting system that transforms the cremated remains of your loved one into a beautiful enduring tree and a living memory of your cherished family member. The Living Urn provides means to honor our loved ones—our family members—when they pass on. By growing a memory tree, we can celebrate and commemorate all they've given us in our life—the joy, the companionship, the love—and keep their memory present in our lives. 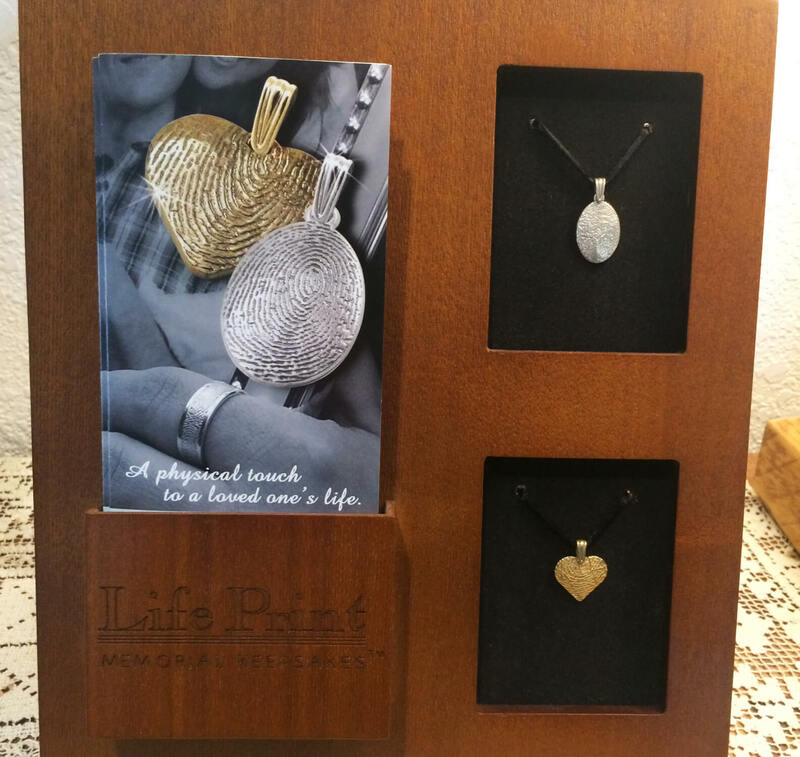 Life Print Keepsakes are made in the USA by using a combination of traditional jewelry techniques, modern technology and your loved one's fingerprint. By offering a physical touch to a loved one's life, they are created from two-dimensional ink prints that are then replicated onto bronze, .925 sterling silver, 14k yellow gold, or 14k white gold. All of the designs can be custom engraved. The Life Print Keepsakes produce a high quality family heirloom that will memorialize you loved one. The Life Print Keepsake pendants with cavities not only have a lasting Life Print inlay but they also can hold a small portion of cremated remains, a lock of hair, or even dried ceremonial flowers. The various and unique custom combinations allow for a beautiful, personal, and lasting connection to the ones we love.